Here on the Deer Tales homestead, we’ve had seven now. We started off with Lavenders. When the last of the line died, we got the standard. 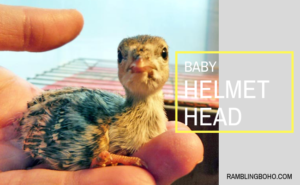 I call them ‘Helmet Heads’ because they have a protruding bone out the top of their skull. Not unlike a spur on the leg of a rooster. 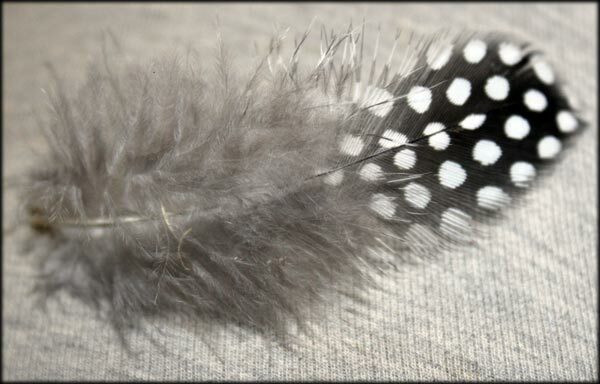 Their feathers are a work of art. I’m always amazed at the beauty of these birds for being such ugly creatures. Guineas are guard birds. Very noisy. The girls make a two-tone sound, like a loud squeaky wheel, where the male’s tone only has one syllable. You can’t tell the girls from the boys until they make this differential sound at a few months old. When my female lavender got taken by a coyote, she was nesting. She thought she was well hidden in the casement window well. She was wrong. I decided to incubate her eggs. Three hatched. One little one was having trouble, and I had to hatch her out. The membrane was dried out, called being shrink-wrapped. She was getting week, and not progressing. If I didn’t pull her out, she would have died within hours. 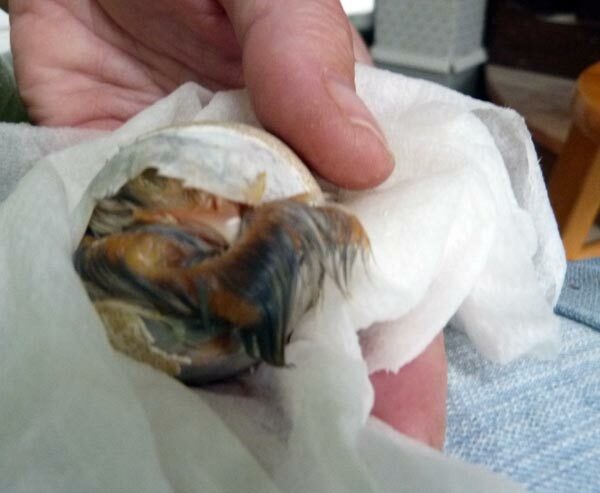 Hatching a bird manually is very dangerous. They can bleed to death very easily if you hit vain, or the umbilical cord, which is very easy to accidentally do since they are tightly curled, and is still attached to the shell. But if the bird is going to die anyway, it’s sometimes worth the chance. I kept the membrane wrapped in a wet paper towel to help soften it so she could kick out on her own. Letting her do as much of the work as possible helps keep the odds of her hatching higher. As she wiggles out keeping a good hold on her is imperative because when they finally evacuate the egg, it’s very forceful. 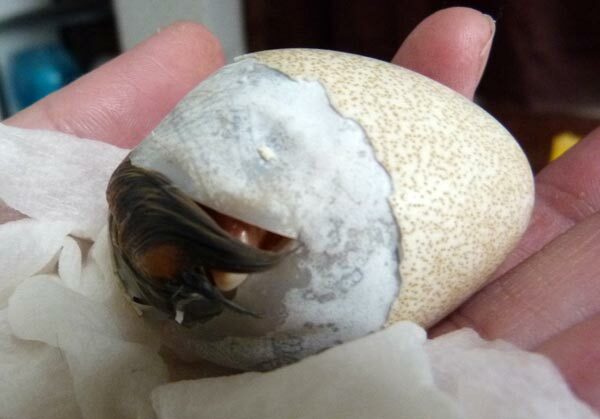 She’ll lose the egg-tooth within a couple days of hatching. This guinea ended up being a very healthy and happy bird. adventures here on Deer Tales. Some have been successful like this one, some not so much. 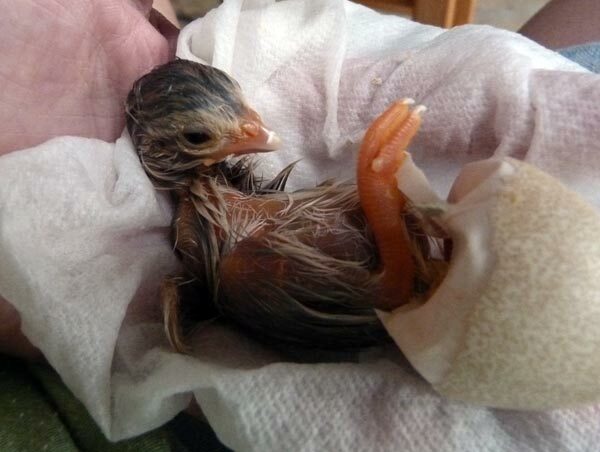 The feeling you get when the new life of a creature emerges in your hands is something that is just indescribable.